I think I may just be a genius after all--well, sort of. 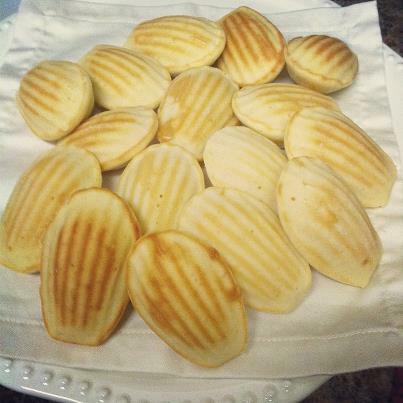 You know how there are certain baking pans that are ostensibly only for the purpose of a certain baked good...take my madeleine pan for instance: it only seems good for turning out perfect little fluted yummies. 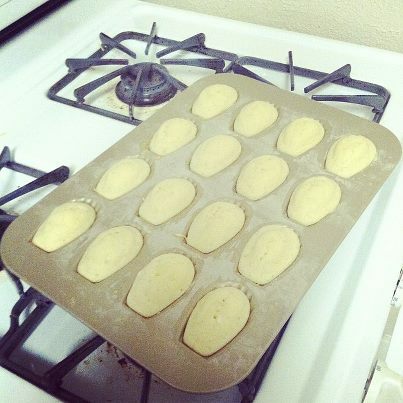 Today, however, I had an idea that would forever convert my madeleine pan into a dual purpose apparatus. Since it is only the two of us in the house, we always seem to have leftover pancake batter when we make pancakes. I hate to throw away good batter, but I usually do since I know we won't use it later. Then, while making pancakes today, it struck me how similar the batter was to madeleine batter. Aha! That's when I came up what shall henceforth be known as Madcakes! Pancake batter + a buttered & floured madeleine pan + about 10 min. in 375* oven = Madcakes. Fluffy delicious little muffin-like morsels of yum! They're not as sweet as cookies and they are much fluffier, but they would be perfect with some jam and butter at tea. 1. In a large bowl, sift together the flour, baking powder, salt and sugar. Make a well in the center and pour in the milk, egg and melted butter; mix until smooth. 2. Heat a lightly oiled griddle or frying pan over medium high heat. Pour or scoop the batter onto the griddle, using approximately 1/4 cup for each pancake. Brown on both sides and serve hot. Moving on to the Madcake directions. . .
Preheat oven to 375* You need to make sure you have at least 3/4 to 1 cup of batter left. I folded in an extra tbsp of melted butter. Butter and flour the pan, then spoon a generous tbsp of batter into each well. Bake at 375* for around 10 minutes, but do check often after they have risen because different batters will cook at different rates. They are done when they spring back to touch or a fork or toothpick comes out clean. Voila! Madcakes! Enjoy with butter, jam, and tea!